dear friend, Claire’s daughter. This invitation sets the tone. 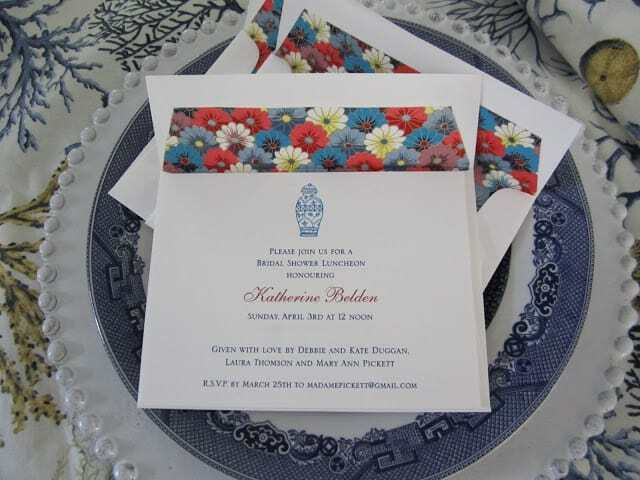 (more on designing elegant invitations economically the future). arrives on Saturday and starts to work her magic. 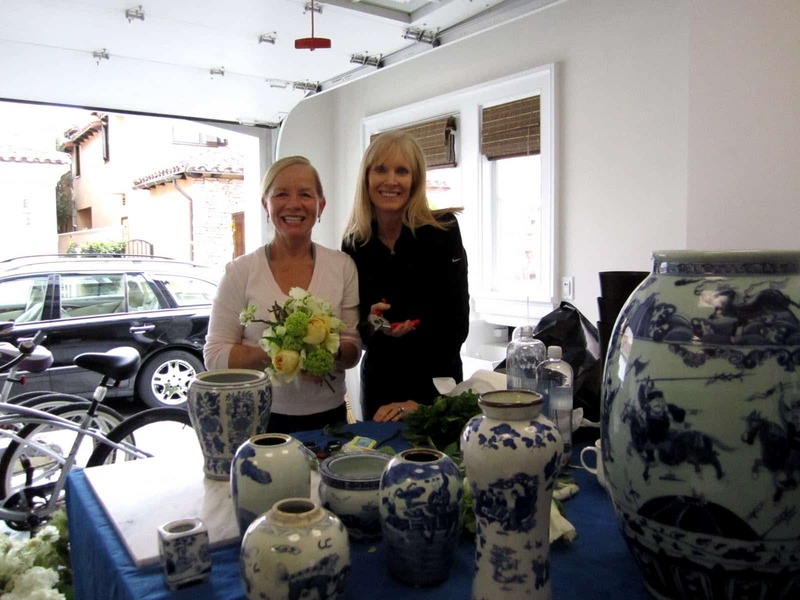 Here are her supplies from the Los Angeles flower market in Debbie’s garage/workshop. 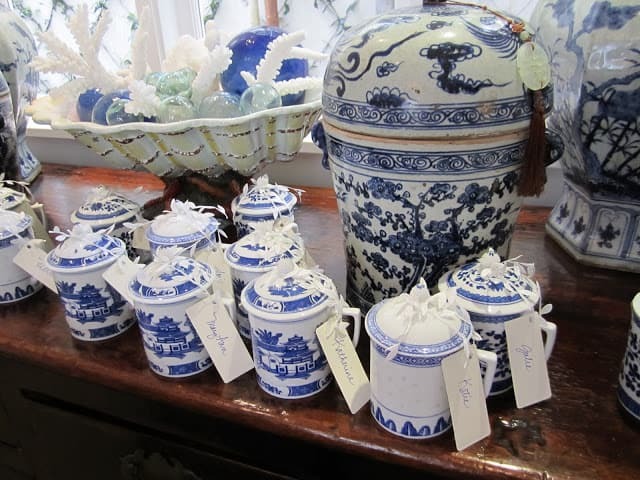 We used Debbie’s and Laura’s blue and white pottery collection for the vases. 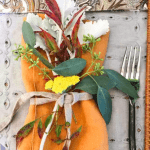 raffia placemats, white chargers, white linen napkins and Spode china. We tied the place cards with white leaf ribbon to the party favors: Chinese mugs with tea inside. Tina brought texture and color with the freshly picked lemons. The branch with lichen adds an organic, rough feel. Six elegant Venetian style Champagne flutes. (Open to U.S. and Canadian residents). Drawing to take place on April 29.
the day of the shower and Champagne toasts. Anything Goes Party and Wow Us Wednesdays. WOW…this shower was beautiful…love all the florals that y'all used. My daughter had her first shower yesterday and it was also very nice…this MOB thing is so much fun:) Looking forward to the day of pics. Enter me in your giveaway…I would love to win these and give them to my daughter…oh yes…I'm a follower. Oh my, this is so pretty! I love the mugs and the flowers and the blue and white! 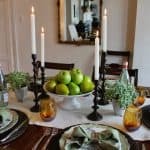 Beautiful table settings! I am a follower and would love those champagne flutes! What a lovely shower it must have been! Thanks for sharing your blues. Oh everything looks absolutely beautiful!! 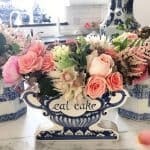 I love the flower arrangements, the table setting and the charming party favors – all perfect!! I have recently won several giveaways so I'd like to give others a chance but wanted to tell you how lovely it all looks!! LOVELY party! 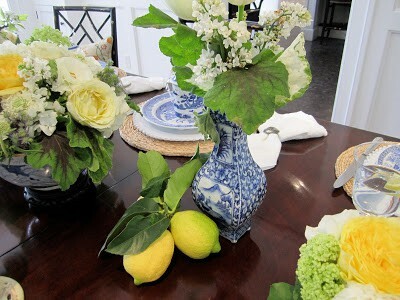 I love the lemons with the blue and white! Wow! The bride must have felt so very special. What care you took with each and every detail! I am going to become a follower and would love to be entered in your give away! Wow so beautiful and you all creative. Love all the blues. Happy blue Monday. 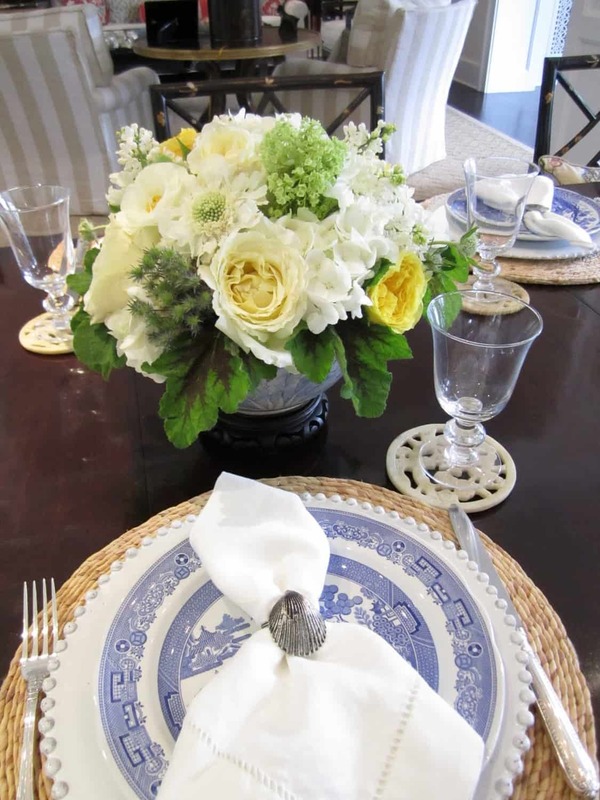 Nothing is more classic than blue and white with a touch of yellow. Those tables are beautifully set and I love the way you did the place cards. I would be happy to win those beautiful glasses. I am a follower. Gorgeous post, I felt like I was there, I wish! Come see my blues, have a great week ahead. Absolutely beautiful colors and ideas for the shower. I am sending this post to a friend who is planning a shower soon. Giving a shower is such a special event. All the effort and beautiful details really makes the bride feel valued! So gorgeous! BTW: That lichen makes the arrangement. Love it! I'm in love with this! So pretty. i'd love to do something like this at home. The table was gorgeous all the way down to the smallest detail. I loved it all and that leaf ribbon caught my eye. Please enter me in your first drawing. I would love those flutes. I look forward to your every post. You are inspirational. Have a great week. Don't know where to start, Mary Ann. The flowers are gorgeous, both tables are stunning, the chinese tea mugs are perfect, and the invitations are so pretty. Love the lining. Have a great day. Can't wait to see the rest. It all has such a classy, elegant look…it is just perfect! 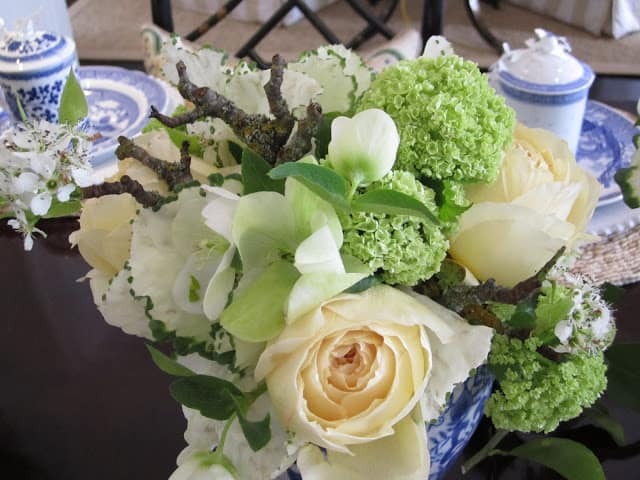 The branches and lichen, can't say enough about them and how well they look in those arrangements!!! Thanks for sharing!!! Beautiful table! 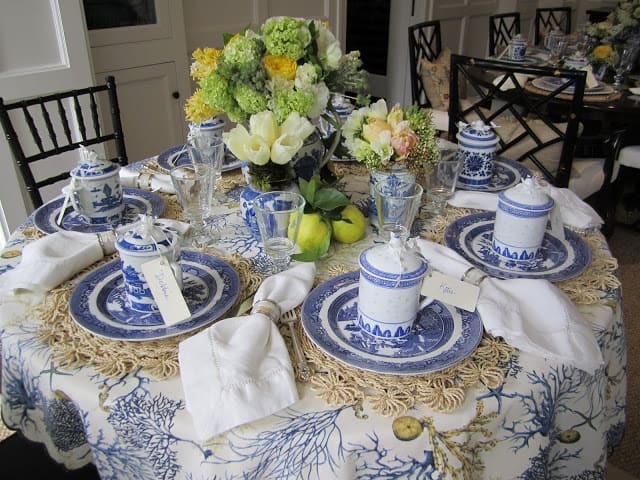 I love your Spode and the bright burst of color from the lemons! And your favors are fantastic! I'm sure the guests were delighted to bring them home. Thanks for sharing and for hosting this terrific giveaway. Those flutes are stunning. Absolutely beautiful – perfection! I never get tired of seeing blue and white. You are all very talented! Wow!! Absolutely gorgeous!!! I love every single detail from the invitation to the flowers to the place settings!! The cobalt blue and white is one of my favorite color combinations. 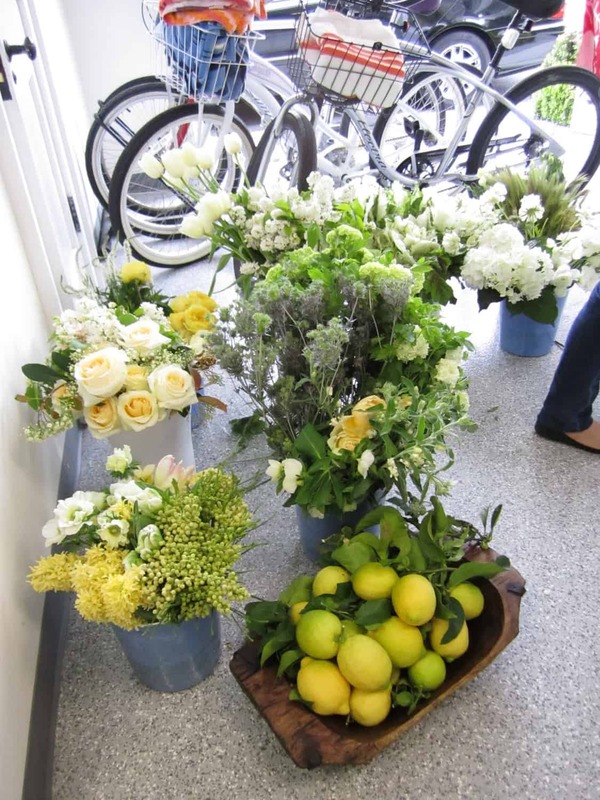 The flowers and lemons are simply gorgeous!! The tea mugs and tea are a wonderful favor idea!!! 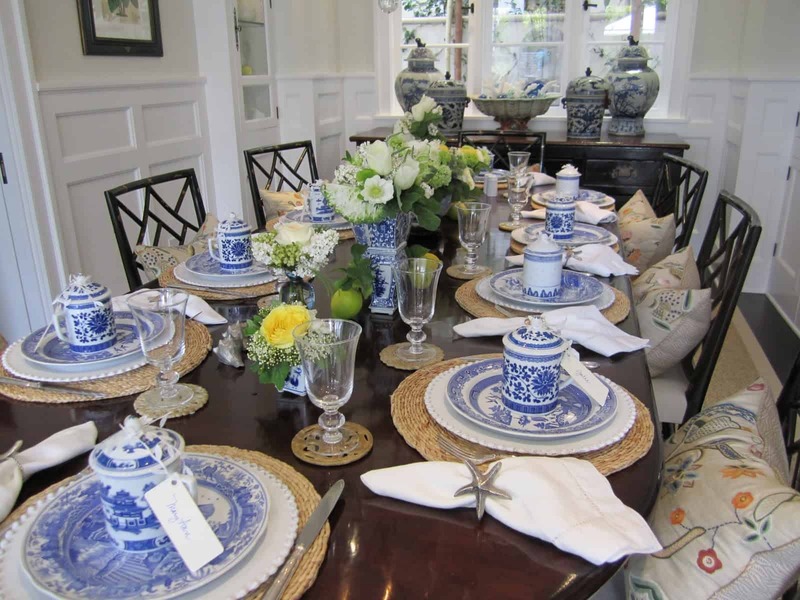 Oh, I love Blue willow and I have a set I use as my everyday china. So reminds me of Mayberry, RFD. I was drooling over all those photos. Oh my goodness-what a fabulous bridal shower! This has to be the most gorgeous table setting for a party I have ever seen!!!!!! It is unbelievable. I want to save these pictures to use for inspiration at my next party!!! Well, you girls sure know how to throw a party! That is one lucky bride 🙂 Simply beautiful. How lovely! I just got engaged in february and I have not even started planning! Since we just moved up the coast, life has been hectic (but awesome!) Thanks for stopping by my blog, Newman wants to be your friend too! WOW! What an elegant and sophisticated table setting. That invitation is to die for! Love it. Love it. Love it. Please come take a look at my entry, thank you! Amazing!!! What an absolutely gorgeous table scape!!! Love the favors too! Usually favors seem pointless or cheesy, but these are gorgeous and completely functional!! The blue and white theme is just perfect! I am sure the bride to be was over the moon! The floral arrangements were beautiful. We are in the planning stages of a shower for my future daughter in law. It really is a lot of fun. I gleaned a lot of ideas here!! Thanks for having such a generous giveaway…the flutes are gorgeous. And I am a follower! What a gorgeous shower! Thanks so much for visiting me at katiedid so I could find you! 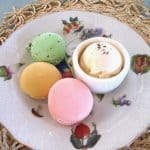 What a beautiful blog. So many inspiring ideas at this shower. I love the lemons on the table especially. And the mugs are such a perfect gift. Beautiful champagne flutes I would love to join the give away! On my way to being a follower! So elegant. A job well done! So beautiful Mary Ann! I love all of the blue & white with the yellow! Looks like it was a great shower. Gorgeous table settings and flowers! I've never seen a shower so beautiful! Everything looked perfect! and I would love to win those flutes! They are so unique! I think the the table setting is stunning. I dare say, better than any I have seen in quite some time in shelter magazines. The lemons were a wonderful addition. Also love the party favor, cardholder idea. Love, love this post. M.
What a beautiful table setting. 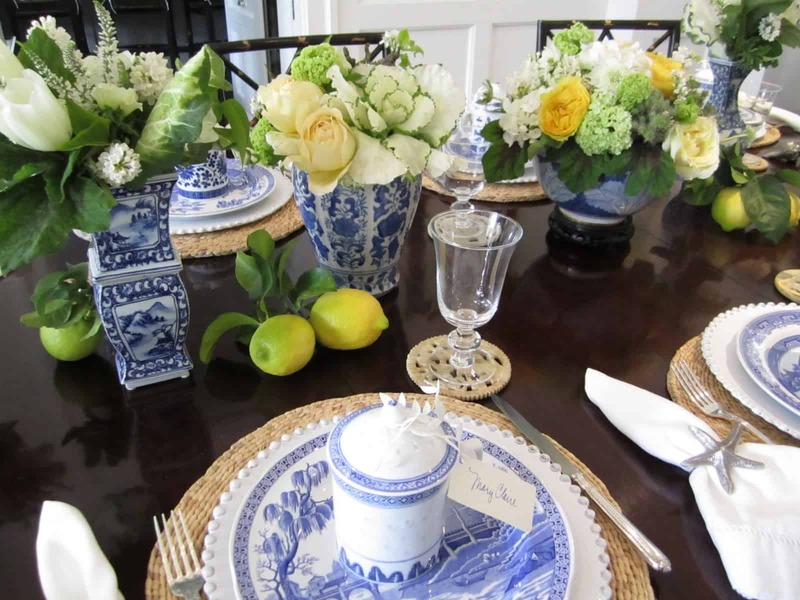 The blue and white is such a timeless combination. I'm sure the bride felt honored. I love all the colors and especially the blue and white with the yellow and green. Lovely decor, flowers, blue and white jars are perfect. Spring and even better a bridal shower visuals have impact beyond measurable inspiration. Perfect post! This is truly a beautifully put together shower! Love the blue and white! The flowers are perfect! What a fresh shower color theme… so perfect for spring & a new bride's beginning.. Love the champagne flutes give-away.. such a generous gift! What a fantastic theme. I am a sucker for blue and white pottery! Love the giveaway -of course I follow! Every detail looks so beautiful! This is BEYOND gorgeous!! Love the blue and white with the whites, yellows and greens…and the beachy touches give it so much interest. Amazing job! I also love the china mug & tea favor – adorable. Absolutely beautiful! I love all the flowers and the blue & white. The tea cups are a great idea for favors/thank you's. I'm sure this was a very exciting day for all! 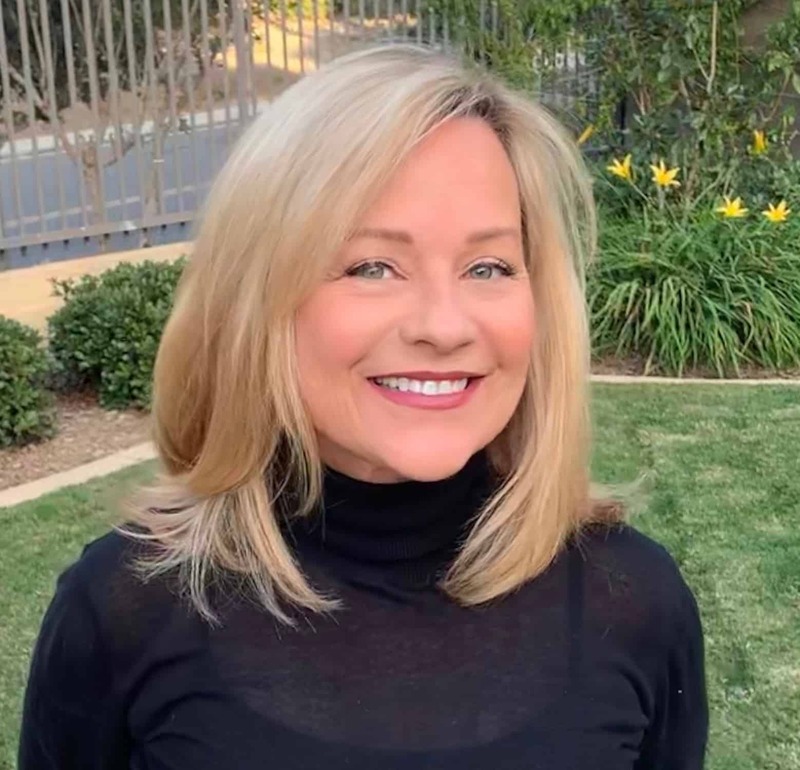 How absolutely gorgeous Mary Ann! I love the blue and white and those spectacular flowers!! What a lucky bride to be. 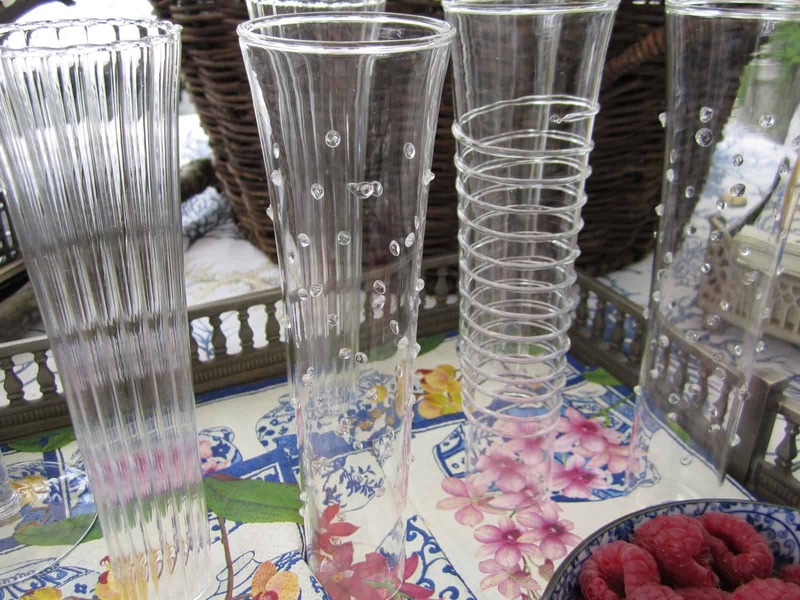 And your champagne flutes – so so pretty! You girls exploded with creativity……well done! Such a lucky bride, so beautiful! So beautiful down to the tiniest detail.Love the mugs! Please enter me in your giveaway. 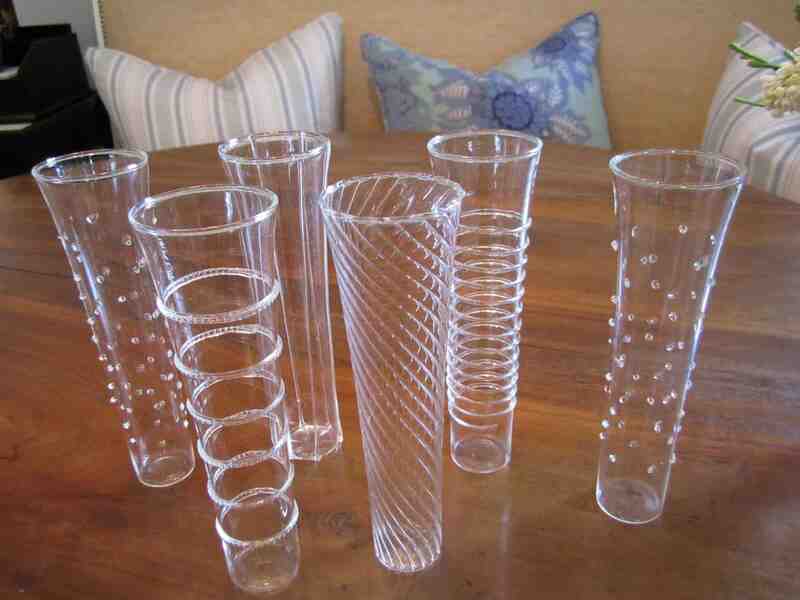 I can already see mimosas in those flutes! I am already a follower. simply gorgeous. thanks for sharing this at my party! I love all of the blue and white, my favorites! What a beautiful shower. I love the idea for the favors. I am getting married in September at the beach and this would be a beautiful bridesmaid luncheon idea! I'm now a follower! What a beautiful shower. I am a new follower. What a beautiful party…the bride must have been thrilled!! Love the flutes, and I'm already a follower. That's the most elegant wedding shower I've seen. Truly lovely. Claire's daughter is a lucky girl. I collect them ! How gorgeous are they and wow the tablescape is so outstanding ! Newest follower and would love a follow back ! Makes me want to have a bridal shower all over again!! Beautiful! Congratulations on a beautiful post and what turned out to be a gorgeous bridal shower! What a beautiful shower. Everything is so elegant!!! I love the giveaway. Please enter me in the giveaway. I love them. What a breath taking shower! Perfect for the bride~to~be! Lots of love was put into it! I would have loved a wedding shower this nice!!!! Love everything!!! How lucky the bride to be is! Especially love the chinese mugs with tea as a party favor – great idea! Wish this was my shower! B-E-A-Utiful!!! What a beautiful shower! I saw both posts and it was just lovely…I felt like I was there. I would love a chance at these beautiful glasses. How gorgeous and what great party favors! I'm your newest follower and would love those flutes! What a visual delight! Thank you for sharing a shower given with warmth and love. Our family loves your posts! What a beautiful shower. Those flutes would be grand with mimosa's on a spring Sunday! I Hope I win. Wow! Mary Ann! What gorgeous dishes!! 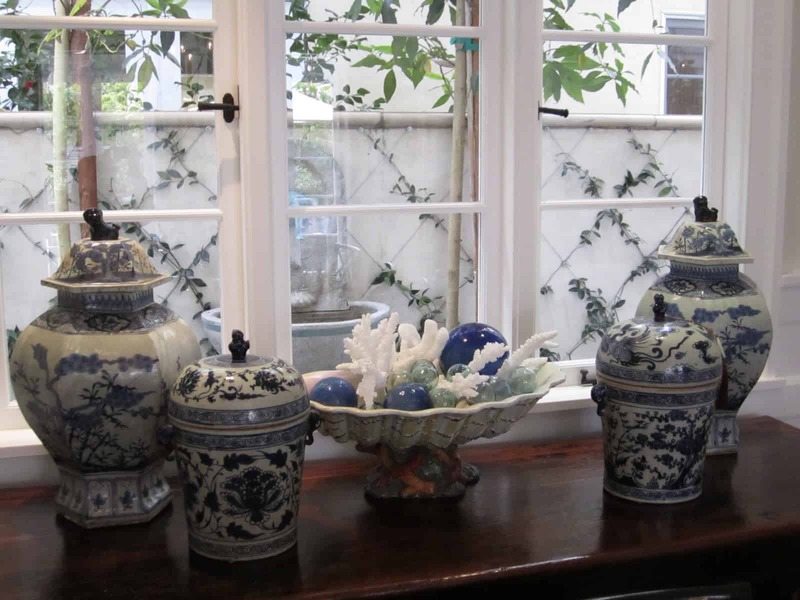 I adore that beautiful blue and white porcelain. I'd love to enter your contest. I do believe I'm a follower..but I'll look around and just make sure. Lovely shower! Just stumbled upon your blog. Beautiful! I love the organic touches. Your blog is lovely. I'll be adding you to my reader! Love the look of the shower..as well as the champagne flutes! The living room looks really great in the phots too, going to look for that post..is it part of your beach house? Just discovered your blog, so awesome! I am now a follower, and this is the first time I have been on your site. Delicious. Can't wait to go through your archives. So beautiful.. and I am a follower of your lovely blog. I'm finally getting a chance to browse your lovely blog after "discovering" it through Hooked on Houses. What an absolutely gorgeous wedding shower! What a lucky girl!! Very pretty, flutes are quite unique. Your blog is very uplifting and quite fun. WOW! What a gorgeous shower…everything! Love the favors too. Love the champagne flutes!